Tattoo takes its rich history from the various tribes and cultures that practised the art form long ago and in some cases, that continue to practice the art form even today. Unfortunately as time passes and technology rapidly makes the world a smaller place, many aspects of the cultures which helped to form the basis for modern day tattoo die out. Their traditions disappear or in the worst case scenarios, the entire culture itself dies out. Of course any rational person doesn’t want to see a tribe or culture die out or for the traditions that they practised to vanish. The Taiwanese have long faced challenges to their own culture, with pressure from the Chinese threatening many aspects of Taiwanese life. But as has always been the case with outside threats to cultures, it’s the indigenous peoples who typically feel the threat the strongest and ultimately suffer the most. Along with the Taroko, the Sediq and Atayal people are indigenous groups that were once prevalent in Taiwan. All three groups practised the art of facial tattoo as a method to mark men when they came of age. The tattoos were done on the foreheads of the men, while women received tattoos on the forehead as well as both of their cheeks. During the Japanese occupation of Taiwan from 1895-1945, the tattoos on the indigenous peoples were looked upon as markings of criminals – a belief that oddly enough, is still upheld today in Japan against those with tattoos. Gradually the indigenous tribes began to disappear and with them their tradition of tattoo. Today, only seven elders of the Taroko people retain their facial tattoos, the oldest being 102 and the youngest being 92. After seeing the rate at which this culture was disappearing, Tian Ku-shi, a Taroko man, has gone off on a one man journey to document and publicise the history of his people and their facial tattoos. 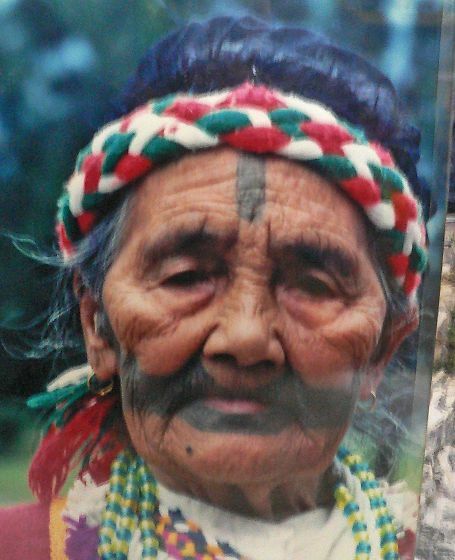 According to Tian, only seven of these elders with facial tattoos remain in Taiwan, with the oldest 102 and the youngest 92. “With time, all will pass away, taking something precious from the world,” he said. As a result of his efforts, Tian has been commended by cultural organisations from several countries around the world, including Japan, The United States, Canada, New Zealand and Singapore. Unfortunately the People’s Republic of China has yet to relay any sort of praise or acknowledgement of Tian’s work. Still, that doesn’t diminish in any way the importance of the work he’s doing, nor does it lessen the quality of the work that he has done and continues to do. I wish him all the best in his endeavours.